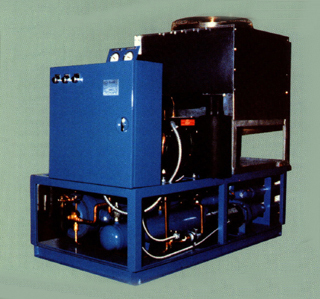 Three horsepower chiller with heat pump that cools or heats water, used in the second heat exchanger, to maintain paint at a precise temperature. In this application, paint (in a dip tank) is to be kept at 80 degrees F. This system was designed to solve two problems. First when the plant is shut down, over the weekend, the paints cools below 80 degrees F. Second, when warm parts are dipped in the tank, the temperature of the paint increases to an intolerable level. The heat pump solved the problems by heating or cooling as needed.